Donruss Playoff Trading Cards announces the signing of Hall of Fame pitcher Sandy Koufax to an exclusive autograph and memorabilia card contract for 2005. "It was 50 years ago this season that Sandy Koufax first stepped onto a Major League pitching mound and into the history books," said Donruss Playoff president Bill Dully. "Having the chance to celebrate milestones like that with Mr. Koufax this season is a once-in-a-lifetime opportunity." Sports Placement Service, Inc. CEO Harlan J. Werner had this to say about the deal. 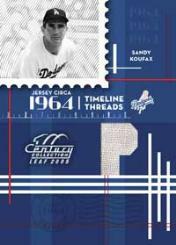 "We are confident by what we have seen thus far, and with Donruss' future plans, that Sandy Koufax will be represented well in the 2005 Donruss product line. We appreciate Donruss� awareness of what a unique and special opportunity it is to secure the rights for one of baseball's greatest players." While Koufax cards will not appear in every 2005 release, he will be included in selected sets including, but not limited to, Donruss Timeless Treasures, Playoff Absolute, Leaf Certified Materials, Leaf Certified Cuts, Leaf Limited and Playoff Prime Cuts. His first appearance on a game-used memorabilia card will be in the Timeless Threads insert set in 2005 Leaf Century Collection which releases January 26. His first autograph card will be available in 2005 Donruss Classics which releases March 16. Werner added, "We were impressed with the philosophy of Donruss - creating a quality product with limited print-runs. This falls right in line with our motto, less is more."